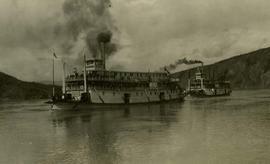 B&W print depicts two steam ships. There is writing on the back which is illegible due to the black backing. 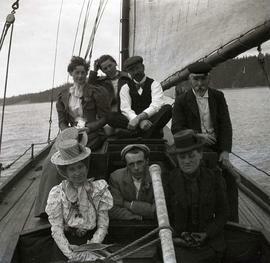 Photograph depicts unidentified people, likely members of the Sylvester family, on a boat. Photograph depicts the side of an unidentified ship. B&W print depicts an unknown woman sitting on a barrel on a boat. Black and white photograph of water, likely taken from onboard a ferry. Black and white photograph of water with a bird flying above, likely taken from onboard a ferry.